Rice-polishing ratio is 8% & 9% ! ! ! ! ! has arrived at KIRAZU in London. Mr Iwao Niizawa who is a master sake brewer has never give up his challenge to make his sake. He is the fifth generation of Niizawa Brewery in Japan which is established in 1873. The famous brand < HAKURAKUSEI > is created by Mr Iwao Niizawa. And he has made very special sake which is called (残響) ZANKYO super 9. ZANKYO Super 9 is only 300 bottles are made each year and of these, only 100 are exported and Super 8 is 1095 bottles are made first time in this year and of these ,only 365 are exported . 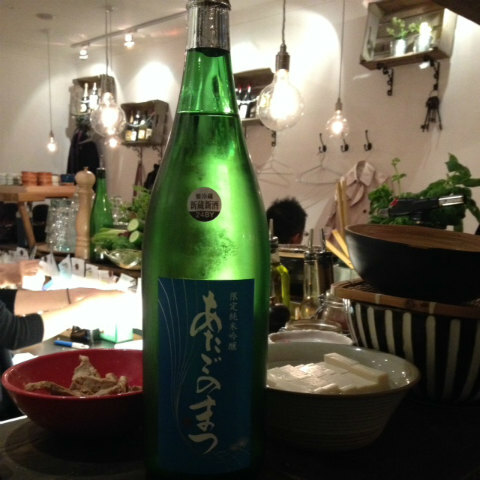 (Daiginjo is usually milled down to 50%, Ginjo 60% and Junmai 70% ). This sake is produced with most high level rice polishing technique which is the best in the world. ZANKYO was given as special gifts to Grammy winners and , yes, our favorite special sake HAKURAKUSEI was provided at Grammy's award party in 2010. 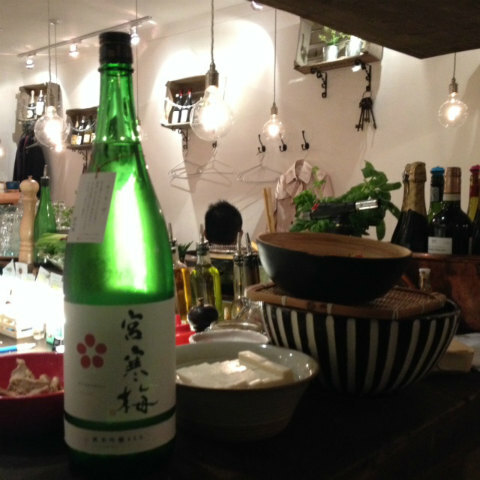 We have ZANKYO at KIRAZU < Japanese tapas restaurant > in London . 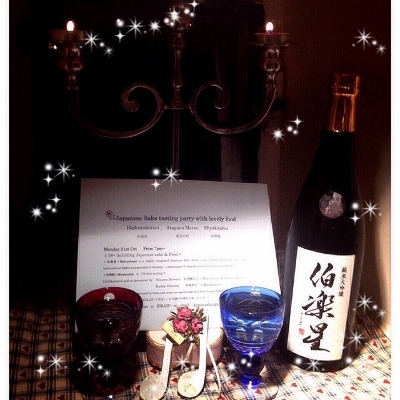 ZANKYO is such an expensive sake which has been sold 2,880 $ < 約30万円＞in the United State !!! 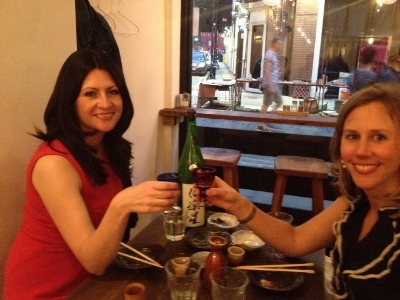 However , we would like you to enjoy ZANKYO with a special price at KIRAZU in London. We are thinking a (special) menu and (special) price for it. 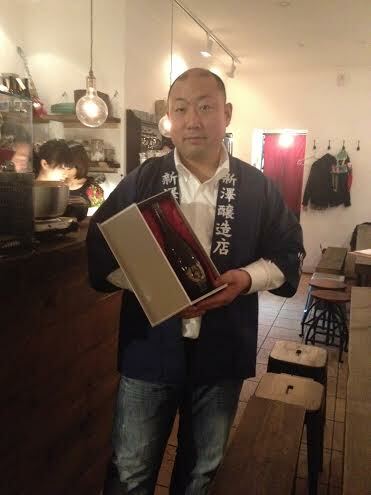 Please visit us, on Thursday 19th Dec.
Mr Iwao Niizawa with ZANKYO(残響)Super8 at KIRAZU in London Saturday 23rd Oct.2013. < 伯楽星＞Hakurakusei is a highly recognized Japanese Sake which is an inflight alcohol for first class international flights and provided at Grammy’s award party. It was also invited to the London Olympics. ＜宮寒梅＞Miyaknnbai is UK first landing.!!! Only a limited number of seats is available, so please reserve your spot soon if you wish to participate. Our restaurant also proposes a new style of drinking sake called" KIRIKO" These were co-sponsored by Mr. Hisayoshi Yamazaki of Aderia Corporation in Japan. We want this to be a fun event that anyone can enjoy, so even people trying sake for the first time should definitely come. 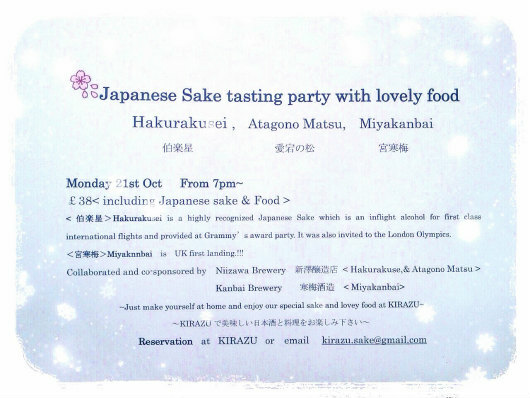 Please send an email to　kirazu.sake☆gmail.com to make your reservation. Please replace the ☆ with an @ sign.